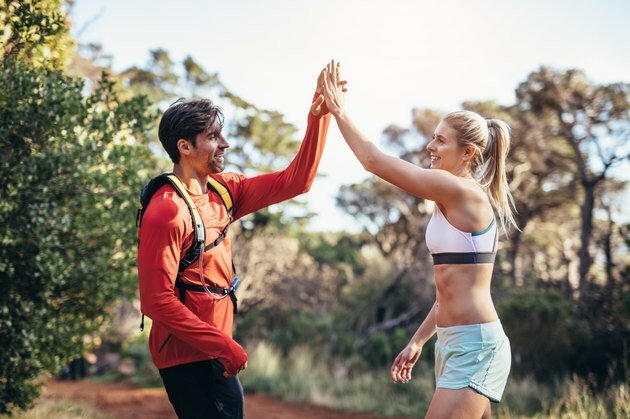 Let’s face it: Your non-runner friends may admire your dedication, but when it comes to understanding the perils and pitfalls of being a member of this unique bunch, it’s safe to say that only another runner knows what being a runner is actually like. From port-o-potty pitstops and chafing in some very awkward spots to your love for all carbs and training shoes, there are certain things all runners know to be true. Here are just 10 of those things. It never fails. You’re 15 minutes into your run, and your bowels decide to unleash the fury of last night's pizza. Sarah Bowen Shea, co-founder of Another Mother Runner, says most runners have experienced a rebellious gut at the exact wrong moment in a training run or race. To sidestep this rebellion, she recommends eating fairly bland food (and nothing new or adventurous) the night before and morning of an important run. Some runners even avoid eating anything leafy and green (kale, spinach, broccoli) in the days leading up to a race, as the added fiber can be irritating to your gut, especially if you're not used to it. You signed up for a race and printed out a training schedule. You've counted down the weeks until race day, but then you notice you're scheduled for an upcoming visit from Aunt Flo. Shea says female runners who race often enough will eventually get their period on exact same day as race day. Instead of lamenting the discomfort, Shea says to tell yourself your lowered hormone levels make your body better able to utilize energy-producing carbohydrates. It's no secret that exercise is good for your body. But ask any runner how physical activity benefits their mental health, and you'll likely hear that running is like therapy. In fact, a 2013 study published in Frontiers in Psychology shows that running can help lower stress, manage symptoms of anxiety and ease depression. That’s why Lea Genders, running coach and personal trainer in Fort Worth, Texas, says she relies on running to help regulate her mood and melt away stress. To non-runners, inconveniences like constructions zones and street fairs are nothing more than an annoying traffic detour. But to runners, they're a welcome sight (hello, port-o-potties!). Although, if you really find yourself in a pinch, Josh LaJaunie, co-founder of WellStart Health and ultramarathon runner, says a sock will do just fine (for the guys, that is). Just don’t put it back on your foot! There’s one thing that unites runners of ALL levels: chafing. Whether its clothes, shoes or other body parts, lots of things rub against your skin when you run. And all that friction can lead to chafing in the most inconvenient spots. The good news? Running coach Martise Moore says that as you progress in your training, you’ll begin to figure out exactly where your most vulnerable areas are (e.g., your inner thighs or your chest). If you want to get a jump on these painful open wounds, she recommends smearing Vaseline or Body Glide on those spots before you run. You know it’s true! Whether you’re running 60 miles each week or aiming for a few five-mile runs, the foam roller is your best friend. Yes, most runners have a love-hate relationship with this piece of torture equipment, but there’s also a good chance you spend more time saddling up to your foam roller than with your significant other (at least during a training cycle!). Unless you plan on running laps around a track for 26.2 miles, once you sign up for a race, you know you're studying that course map until you know it like the back of your hand. Nita Sweeney, runner and author of Depression Hates a Moving Target: How Running with My Dog Brought Me Back from the Brink, says runners are also experts at reading between the lines of race descriptions. For example, if you see the term “gently rolling hills,” you know you better train at altitude. So the next time you register for a race, check out the course map and choose a training plan that matches the demands of the run. There’s a reason you don’t see volunteers handing out slabs of meat during a race. Anyone who's serious about running (or serious about fitness in general) knows that carbohydrates are the go-to fuel source for your body, especially during exercise. So why would you run a race without them? Peloton Tread instructor Matty Maggiacomo says the current trends of low-carb and no-carb diets try to make people believe that carbohydrates are a bad thing, when in fact, they're the preferred fuel source for an endurance athlete. His advice? Don't be afraid to order that sweet potato (or three!) or bowl of pasta before your race. OK, confession time: How many pairs of running shoes are in your closet? If there's one thing that all runners know, it’s that your one true love (second to the miles) are the shoes on your feet. “Ask any runner, and they'll tell you that nothing stops them in their tracks more than a pair of newly released fresh kicks from their go-to brand,” says Maggiacomo. Most non-runners cringe at the sight of "short shorts." But if you’re a runner, you know just how wonderful the Daisy Dukes of the fitness world can be. Maggiacomo says a "short short" just makes you FEEL faster. “And for some reason, you don't even care that you're showing off when you've got your running shorts on, because if you're running fast enough, they won't have time to snap a pic,” he says.